A great article by these talented writers click here for original article all content re-posted from Bloomberg Technology…. U.S. regulators approved a revolutionary new cancer treatment from Novartis AG on Wednesday, the first in a group of coming therapies that offer breakthrough cures for dire cases as well as stratospheric costs. Known as CAR-T therapy, the treatment involves extracting a patient’s immune system cells and modifying them to attack aggressive blood cancers. Novartis will charge $475,000 for the one-time drug, called Kymriah, and said it’s developing programs where it will only get paid if patients respond to it. The U.S. Food and Drug Administration’s approval came weeks earlier than scheduled. It’s a benchmark moment for patients, who in recent years have gained new treatments for skin, lung and blood cancers that once considered incurable. It’s also a validation for the drug industry amid a high-stakes race to dominate a market worth billions of dollars. The immune system has proven a potent weapon for pharmaceutical developers. Some of the new treatments undo cancer’s cloaking mechanisms that enable tumors to hide from the body’s defenses. Others, like Novartis’s, actually modify the cells in a complex, one-off process and help them attack the disease. Novartis said it could have charged as much as $600,000 or $750,000 for the treatment and still been cost-effective. The company has made an agreement with the U.S. government to pay for the drug only when pediatric or young adult patients with the cancer respond to treatment by the end of their first month. That agreement could have implications for other drugmakers developing costly one-time, curative therapies. Novartis said its working on similar agreements with other payers. Even with the $475,000 cost, the drug is expected to generate limited revenue at first, because of the relatively small number of patients, said Tim Anderson, an analyst with Sanford C. Bernstein & Co.
About 3,100 Americans aged 20 and younger are diagnosed with acute lymphoblastic leukemia each year, according to the National Cancer Institute. Of those, about 600 patients whose disease relapses or doesn’t respond will be eligible for the Novartis treatment, according to the company. Future uses for the drug in more cancers “could be much larger, but the offset to a larger population would be a lower price most likely,” Anderson said in a note to clients. He said he expects the company to price the drug differently for other cancers. The drug is approved for children and young adults up to age 25 with cancers that don’t respond to traditional treatment, or who are suffering from a second relapse, a broad indication that will give more patients access to the novel technology. The FDA’s approval came weeks ahead of schedule. With the treatments available now, fewer than 10 percent of patients with relapsed, hard-to-treat ALL are alive five years after diagnosis. In a trial of Kymriah, 83 percent of 63 patients with hard-to-treat disease were in remission within three months, according to Novartis. 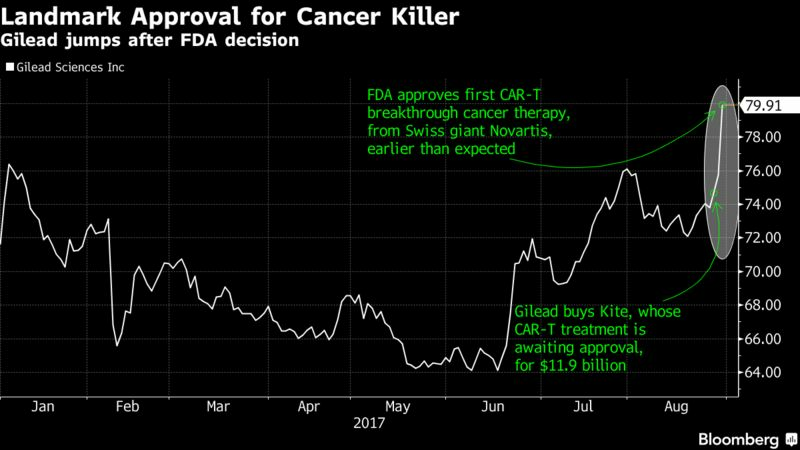 The approval of Novartis’ CAR-T therapy comes just two days after Gilead Sciences Inc. announced an agreement to spend $11.9 billion and buy Kite Pharma Inc., which is developing its own CAR-T therapy scheduled for an FDA ruling by Nov. 29. Gilead shares rose 5.1 percent to $79.57 at 12:55 p.m. in New York. Shares of Novartis closed on Wednesday at 79.25 euros, up less than 0.1 percent. Kymriah will carry a boxed warning because of the treatment’s potential to cause deadly side effects, including neurological complications and what’s known as cytokine release syndrome, a systemic reaction triggered by the destruction of the cancer cells. The FDA also approved Roche Holding AG’s Actemra to treat patients with cytokine release syndrome, pointing to research that shows 69 percent of patients suffering from it improved completely after one or two doses. Shares of Juno Therapeutics Inc., another CAR-T maker, fell 5.8 percent to $41.26. Bluebird Bio Inc., which is also developing one of the treatments, rose 13 percent.